Anriel Howard drives past Oti Gildon, while Maite Cazorla looks on. Zach Wilkinson photo. The difference, though, goes beyond names. Much has been made of NET rankings now employed by the men’s tournament selection committee. The NCAA’s NET rankings begin with traditional factors, such as winning percentage and the quality of the team’s wins. But in addition to these measures, it also considers each team’s net efficiency. Meanwhile, the women’s tournament appears to rely more on just watching games and rudimentary stats, like won-loss records and RPI. Although such information is useful, net efficiency tends to tell us a bit more. Net efficiency is the difference between each team’s offensive and defensive efficiency. More specifically, net efficiency – or what I refer to as efficiency differential – is the difference between how many points a team scores per possession (offensive efficiency) and how many points a team surrenders per possession (defensive efficiency). For example, this season Oregon scored at a rate of 123.8 points per 100 possessions. 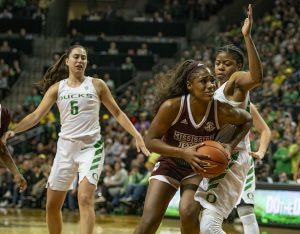 Of the 349 teams that played Division I women’s college basketball, the Ducks’ mark ranked first. On the defensive side, though, they were not quite as good. Per 100 possessions, Oregon allowed 90.5 points, ranking 151st. Consequently, despite have college basketball’s best offense, the efficiency differential of the Ducks, at 33.3, only ranked fourth in college basketball. Thus, the best offensive team in the game may not be the best one. Fourth-best suggests Oregon might be a favorite to land in the Final Four, but unfortunately, the Tournament seeding indicates there is a significant roadblock to the team earning a trip to Tampa Bay in April. The current 2019 title odds do not quite match up with the story told by efficiency differential. Currently, Baylor and Notre Dame are the favorites to capture the title. But Baylor only ranks third in efficiency differential, while Notre Dame, with a differential of 33.1, ranks fifth. The top team in efficiency differential, Mississippi State, is only listed as a 10/1 favorite. So the betting market doesn’t quite match what we see when we consider offensive and defensive efficiency. And because Oregon is in the same region as Mississippi State, the Ducks’ path to the Final Four appears to be blocked. Because of where Oregon is placed in the Tournament, the betting odds and efficiency differential end up predicting the same Final Four. 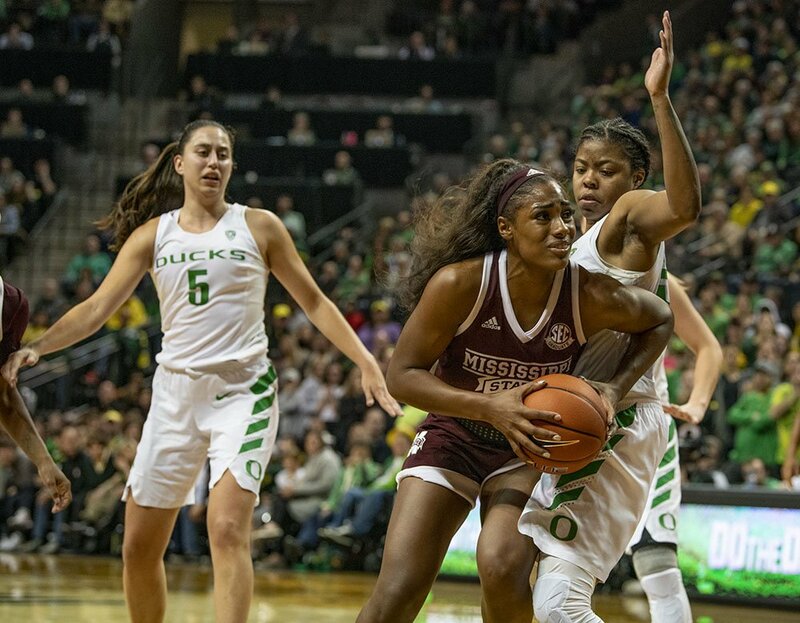 Both approaches suggest the Final Four will be Mississippi State, Connecticut, Baylor, and Notre Dame. This also means that Louisville – the number one seed in the Midwest – is not a favorite to reach the Final Four. The Cardinal’s efficiency differential 26.4 only ranks eighth in college basketball. What follows is the offensive efficiency, defensive efficiency, and efficiency differential of each team in the tournament. It is important to remember that efficiency differential is but one element to consider when evaluating a team. Each program plays different schedules in college basketball. So a very high-efficiency differential from a team from a weak conference may not be as impressive as a lesser differential from a team in a stronger conference. That being said, it is useful to think about the quality of each team’s offense and defense. Across all teams in Division I, the average is 92.9 points scored and allowed per 100 possessions. Almost every team in the Tournament is better than the average college team in offensive efficiency. But teams like Iowa, California, North Carolina, UCLA, and Tennessee are all below average in terms of defensive efficiency. So although Iowa has the best offense in the East Region (yes, better than Baylor), their relatively weak defense suggests they might have trouble working their way through the field of 64. Of course, all this analysis is just a “suggestion” This is a single-elimination tournament. On any given day a player or team can do better, or worse, than their historical averages. So the stats can’t tell us with certainty who is going to win or lose. But they can tell us which teams were better or worse in the games played before the Tournament started. Fowles goes 11 and 11 as Lynx barely weather the Storm.